Like many developers I searched within the ucancode and other sites for a control similar to this one but could not find one so I decided to create my own. I needed a control with similar functionality, but not exactly the same as the Calendar control found in MS Outlook. This piece or code/control was developed to help me display appointments and tucancode.nets in a Real Estate program that I am developing. I did not like the one that was already available but I wanted the look and feel to be similar to MS-Outlook. I hope you will find this control useful and use it in your applications. It is completely written using MFC (no ATL, no Unicode, no .NET). If you want this you are free to modify the code. This code has been tested in Win 2000 and Win XP Professional. I have not tested it on any other versions of Windows, but the only function I would worry about is GradientFill, but according to MSDN it is available as of Win 98 so it would work fine from that version on. This code compiles successfully in VS 6 and VS .NET 2003. This is a work in progress so further additions to the code will be coming. Does not support date items of more than one day. This is a feature I will be adding later. Does not support drag-and-drop of date items from one date cell to another. This is a feature I will be adding later. One of the things I learned about the original Outlook Calendar control after I created this control was that it can display week views from 1 to 6 weeks at a time. This is one of the modifications I will be making to this control in the near future. This control and the source code are free to be used with commercial and non commercial software. However you are not allowed to sell the source code for profit. The author of this article does not take any responsibility for any damage done or caused directly or indirectly by this source code or an application using this source code. If you decide to redistribute the source code, please include my name and e-mail somewhere in the source. If you create an application with this control, I would appreciate an email describing what it is or a screen shot of it so that I'll know it is being used and may serve as an incentive to continue improving this code/control. Special thanks go to Tom Furuya for sharing his excellent ColorSpy utility. It was very useful in determining the colors and the magnified views of the mouse pointer locations were critical in getting some of the drawing dimensions correct in this control. The code and its classes in this article provide all the functionality to not only display a Calendar control in Week or Month views but also to include and display entries (Appointments/Tucancode.nets) for the selected dates. Although this code does not provide the dialog boxes or windows necessary to enter entries it does provide you with the methods, properties and overridables necessary to create, modify and delete these entries. I know this code is not perfect and that someone may actually find a better way to paint the control. I have done all that I can to make sure the painting of different views are as efficient as possible. Of course, if I make further enhancements or fixes to the code or if any of you come up with fixes, I will update this article. You will also need to add a library link to the project. For VS 6, click on Project + Settings... (Alt+F7) to display the Project Settings dialog box. On the Settings For... dropdown ListBox select All Configurations. Next, click on the Link tab and enter "msimg32.lib" within the Object/library modules. This library is needed to use the GradientFill Windows function, which is used to highlight the current day of the Month or Week. For VS 7, click on the Project + <ProjectName> Properties... menu option to display the Project Property Pages dialog box. Select All Configurations from the Configuration: dropdown ListBox. Click on the Linker option from the tree control. Next click on Input to display the input values. For Additional Dependencies enter "msimg32.lib". This library is needed to use the GradientFill Windows function, which is used to highlight the current day of the Month or Week. You also need to add a custom control object within your FormView or Dialog Window. Make sure to name the class: DBSWMDateCtrl. Now we create the variable for this control. Assign the variable name m_WVCtrl by pressing the right mouse button on the Dialog or FormView class and clicking the Add Member Variable... menu option. Enter CWMDateCtrl as the variable type and m_WVCtrl as the variable name. 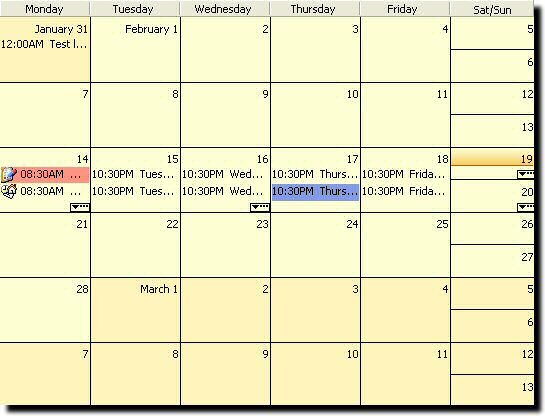 When you compile your code and display the window which contains this custom control you should see the Calendar control displayed in Week or Month view. These functions are in alphabetical order. This method is used to delete all the data items related to this control. This method is used to delete a specific data item as specified by the nItem parameter. The parameter is the ID number of the data item added to the custom control with the InsertItem method. Returns the current date for this control. The current date is the highlighted cell within the Week or Month view. Use this method to retrieve the current start and end date based on how the control is displayed. If the control is displayed in Month view, as pictured above, this method will return the following values: pStartDate will equal 1/31/2005 and pEndDate will equal 3/13/2005. 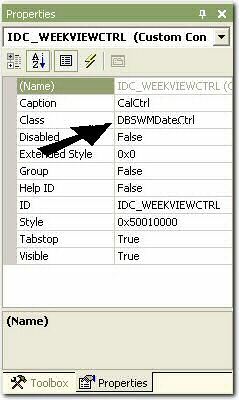 If the control is displayed in Week view, as pictured above, this method will return the following values: pStartDate will equal 2/14/2005 and pEndDate will equal 2/20/2005. This method returns the day, month or year of the current date. This method returns one of two values WV_WEEKVIEW or WV_MONTHVIEW. This indicates the current display state of the control. Returns a 32-bit application-specific value associated with the specified item. Inserts a date item into the custom control. For an item to be displayed within the control the first parameter of this method should be within range of the date set by the SetCurrentDate method. The next two parameters are optional and are used to specify if the date item time is displayed using regular (FALSE) or military (TRUE) time and which image from an attached image list is used when painting the date item. Returns a TRUE or FALSE value to determine if the time portion of the date entries are displayed using military time (TRUE) or regular time (FALSE). Changes the background color of the Calendar control. This method is used to specify the date that is to be used as the current date, if we are displaying the date item times using Military or Regular time and the type of view to be used. Using this method you have to specify a date, preferably the current date (this would be the highlighted date within the control). This control would take this date and determine which other dates are to be painted based on the specified view. // today's date would be highlighted. Use this method to change the default font and font size to be used to paint the Calendar control. Use this method to attach an image list to the Calendar control. The example below shows how to attach a 256 color 16 X 16 bitmap to the control. Use this method to set or change the background color of individual date items. 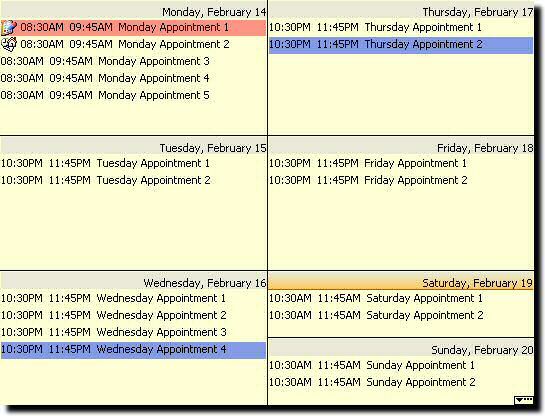 This is useful to identify the type of appointments and tucancode.nets based on color. This function sets the 32-bit application-specific value associated with the item specified by nItem. Use this method to set or change the display of date item times. Setting the parameter to TRUE will paint the date item times using Military time, otherwise Regular time is used. This method affects the entire Calendar control. Use this method to change the way the Calendar control is painted. The values which can be used are WV_WEEKVIEW or WV_MONTHVIEW. Edit the OnCellDblClick/OnCellClick member function. To access the Calendar information you need to cast pNotifyStruct to NM_WVCELLDATA. This member variable contains all the information regarding the actual date cell of the Calendar control. You have access to many functions and procedures which directly affect the appearance and behaviour of the Calendar date cell. Take a look at the WVCellData.h and WVCellData.cpp files for more information on this Calendar object. I believe all the procedures and functions are self explanatory. This member variable is usually NULL unless the user clicks or double clicks on a data item within a date cell of the Calendar control. You have access to functions and procedure which directly affect the particular date item data. Take a look at the WVCellDataItem.h and WVCellDataItem.cpp files for more information on this Calendar date item object. I believe the procedures and functions are self-explanatory. These two member variables contain the mouse pointer coordinates where the actual click or double click has occurred. This is a special member variable. This member variable will have a value of TRUE only when the user clicks on the Does Not Fit rectangle which is located at the bottom right part of any Calendar date cell which can't display all of the date items within the available cell area. When the user clicks on this object, the Calendar control will notify the parent window as if the user has double clicked the cell at which point this member variable will be set to TRUE. It is up to you to decide how you want to handle this. I use this feature to change the Calendar view from Month to Week view. This is the ID number given to the Calendar date item (pItem) when the InsertItem function is used. Look at the OnCellClick and OnBtndeleteitem member functions within the demo program to find out how I have used this member variable (CalCtrlDlg.cpp).